Power management company Eaton South Africa won the Best Paper Award for its “Microgrids for Commercial and Industrial” paper at the Power-Gen and DistribuTech Africa Conference, held in Johannesburg recently. 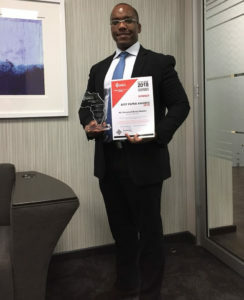 An example case study of a microgrid installed on Eaton’s premises in Wadeville, Germiston was presented by Bunty Kiremire, the senior application leader for microgrid energy systems at Eaton, on behalf of the World Business Council for Sustainable Development (WBCSD). WBCSD is a global, CEO-led organisation of 200 forward-thinking businesses working together to accelerate the transition to a sustainable world, and Eaton, as a member, has been active in the working groups on expanding sustainability. The presentation highlighted the increasing value for commercial and industrial companies to implement low-carbon microgrids which deliver power reliability, lower energy costs and lower emissions. The company’s microgrid was installed at its LV and MV assembly manufacturing plant in March 2018.